This biography of Daniel Webster for young children was excerpted from Mary Stoyell Stimpson's book, A Child's Book of American Biography (1915). Add over one hundred years to Ms. Stimpson's time reference when you read it with your children. Older children may enjoy the chapter book, The Story of Daniel Webster by James Baldwin. Before New England became such a busy, hurried sort of a place—say a hundred years ago—its men and women had time to listen to sermons that were more than an hour long, or to lecturers who talked three or four hours. When a public speaker used very fine words and could keep the people who listened to him wide awake and eager to hear more, he was called a great orator. An orator who dazzled our grandfathers and grandmothers was named Daniel Webster. He has been dead a long time, but the public speeches he made will never be forgotten. Down in the business part of Boston can be seen, on a large building, a tablet which reads "The Home of Daniel Webster." On the terraced lawn of Massachusetts' State house stands a bronze statue of Daniel Webster. And in old Faneuil Hall, Boston (which is called the Cradle of Liberty), there is a huge painting, as long as—well—as long as a street-car, which is called "Webster's Reply to Hayne." In this picture there are the portraits of one hundred and thirty senators and other men, but all of them are watching Daniel Webster. This is a picture well worth seeing, and Webster was well worth hearing. Daniel Webster was born in New Hampshire. When he was a year old, his parents moved onto a farm which they called "The Elms" on account of the fine old trees which grew there. The older Webster boys did all kinds of heavy work, but as Daniel was not very strong, he was petted, and as he grew up, was asked to do only very light work. He rode the plow horse in the fields, drove the cows to pasture, and tended logs in his father's sawmill. When he was sent to do this last, he always took a book along, because it took twenty minutes for the saw to work its teeth through one of the tree-trunks, and he could not bear to waste all that time. He learned to read from his mother and sister almost as soon as he could talk, and he pored over the Bible for hours at a time. Daniel's father kept a tavern, besides carrying on his farm. The teamsters who got their dinners there used to ask Daniel to read to them. His voice was deep and musical, and he gave such meaning to the words of the Bible that they thought him a wonder. His eyes were like black velvet, and his hair was as black and shiny as the feathers of a crow. Every one called him "little black Dan." Daniel read everything he could find, and could recite whole poems and chapters of books when he was quite small. At a country store, just across the road from his father's tavern, he bought a cotton pocket-handkerchief on which the Constitution of the United States was printed. After looking at the eagles and flags which were printed as a border, he sat down under one of the giant elm trees and learned by heart every word printed there. Daniel liked to wander along the banks of the Merrimac River, and as he played in the fields and woods, he learned a great deal about animals and plants. Robert Wise taught him to fish for the salmon and shad that were plenty about there. Robert Wise was an old English sailor, who lived with his wife in a cottage on the Webster farm. He told Daniel famous stories of the strange countries he had sailed to. This man could not read, so he felt well repaid for carrying little black Dan on his shoulder, or paddling him up and down streams half a day at a time, if the boy would go after supper to his cottage and read aloud to him from books or newspapers. Daniel loved all outdoor beauty, the sun, moon, and stars, the ocean, and the wind. In almost every one of the great speeches that he made, as a middle-aged, or old man, he mentioned them. In the state of New Hampshire, when Daniel was a boy, teachers and schools were scarce. A man or a woman would teach a few weeks in one town and then move on to another. They were called traveling teachers. This was done because there were not anywhere near enough teachers to go round, and it was thought only fair that each little village or town should get its few weeks. Daniel followed these traveling teachers a long time every year, sometimes walking two or three miles a day, at other times boarding away from home. Nothing was taught in these schools but reading and writing. Daniel was an almost perfect reader but a poor writer. One of Daniel's teachers wanted his pupils to know good poems and chapters of books by heart. He offered a prize—a jack-knife—to the one who should learn the most verses from the Bible. One after another was called upon to recite. They had found it rather hard, and many of them had learned but eight or ten verses at the most. When it was Daniel's turn, he recited chapter after chapter. He kept on and on until it was time for the teacher to dismiss school. Mr. Tappan said: "Well, there is no doubt you deserve the prize. How many more chapters did you learn?" "Oh, a lot more," answered Dan, laughing. After Daniel was twelve, he began to grow stronger and did his share of work on the farm. One day when he was helping his father in the hayfield, Mr. Webster said: "Daniel, it is the men who have fine educations that succeed in this world. I do not intend that you shall be a drudge all your days. I am going to send you through college." Daniel was so pleased at this that he sat right down on the hay and cried. When Daniel was fitting for college at Exeter, he was about the brightest pupil there, but it did seem funny that the boy who was to one day be a great orator could not then declaim or recite before the school. He would learn the nicest pieces and practise them in his own room, but when he stood up before all the scholars and teachers, his courage left him. Sometimes, when his name was called, he could not rise from his seat. He was very much ashamed of himself and shed a good many tears over his shyness. But he persevered and finally did better than any of the boys. There is nothing like trying things enough times. 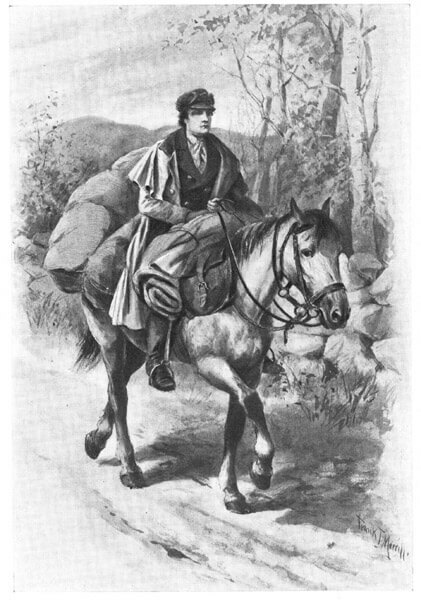 When Daniel went to Dartmouth College, he rode there on horseback, carrying his feather-bed, blankets, clothes, and books on his horse. He was still such a dark looking person that the students thought he was an Indian. Daniel studied law and made very fine pleas in the courtrooms. He was a senator in Congress, a secretary of state, and a public speaker who was admired in England as well as in America. Mr. Webster had a wife and children. He bought a large estate at Marshfield in Massachusetts, where the family spent many summers. He loved children and animals, was kind to the poor, and bought the freedom of several slaves. He was very neat in dress. His favorite costume for court and senate was a blue coat with brass buttons, a buff waistcoat, and black trousers. Daniel Webster always liked to look up old friends and was never cold or haughty to any one. Once when he was going through the West, making famous speeches in the different cities, a man crowded forward to speak to him, saying: "Why, is this little black Dan that used to water my horses?" The dignified orator did not mind a bit. "Yes," he laughed, "I'm little black Dan grown up!" Daniel was a good son to the father, who had tried hard to make him a fine scholar. Only once did he disappoint him. That was when he refused to be clerk of court. When his father begged him to take that place, he said: "No, father, I am going to use my tongue in courts, not my pen. I mean to be an orator!" He proved to be one of America's great ones. Daniel Webster's biography is featured in our collection, American Biographies for Kids. Visit American History to find out about other important people and how their writings helped shape the country.